Grand Magic Games. Pictures of teams and Blue pegasus members in the Grand Magic Games. Wallpaper and background images in the Fairy Tail club tagged: fairy tail. 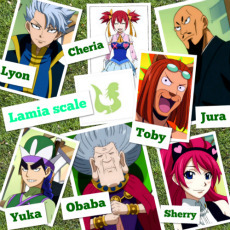 This Fairy Tail photo contains anime, comic kitabu, manga, cartoon, and mkono. There might also be umeme jokofu, friji, jokofu umeme, gazeti, karatasi, magazine, tabloid, rag, jarida, tabloidi, and limemalizwa.